The search for the right tripod and ballhead is a rite of passage for photographers. Eventually you meet someone who puts his arm on your shoulder with compassion and looks at you with the experienced eyes of someone who shares your pain. With that consoling sound in their voice as if saying, “I know what you are going through,” they tell you about Really Right Stuff. Really Right Stuff is probably one of the best kept secrets in photography. It is the pro photographer’s secret ingredient that isn’t shared until you’ve reached a certain level of proficiency with your camera. Maybe it’s because you can’t buy Really Right Stuff products in retail stores and they aren’t offered on line from B&H or Adorama. Maybe because Really Right Stuff does not have a big advertising budget because their customer base is mostly word of mouth or because their products are so high end expensive that new photographers are scared off. 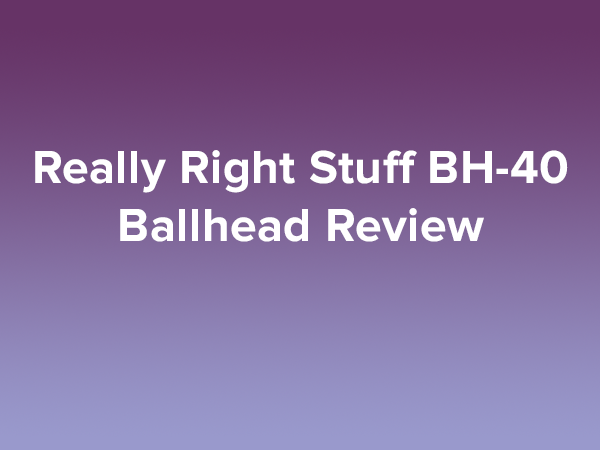 Whatever the reason, Really Right Stuff ballheads are rarely a photographer’s first ballhead. I went through three under $125 ballheads. My first was a $45 pan and tilt with long knobs to control the angle. It drooped and could not keep my Nikon N80 steady with the simplest zoom lens. I thought the problem was those long knobs that must be designed for video rather than sill cameras so I bought a pistol grip ballhead for $80 on sale at my local camera shop. That solved my problem. The pistol grip is nice because you can intuitively move the camera around and the Vanguard model that I chose was better suited for the weight of my Nikon with its kit lens. After carrying the pistol grip ballhead around for a few months I felt that I needed to do something to lighten my load. Most photographers use a simpler and compact ballhead. So I began my online research. After what seemed like weeks of searching on line, comparing ballheads, studying how I am using my tripod and thinking, I settled on the Vanguard BH-300. When it arrived, I felt that my time was rewarded and I finally got the right ballhead. One night, every photographer’s nightmare happened. After I walked up 8 flights of stairs to get to my location for some cityscapes, I set up my tripod, waited for the light and then realized that I lost the camera plate and could not attach my camera to the ballhead. The simplest, smallest, and least expensive piece of equipment was not in my camera bag and my shot was lost. The night ended in frustration. It was right around that time that I had met Bryan Peterson for the first time. Bryan’s passion for his Manfrotto 190 tripod and Really Right Stuff ballhead is palpable. You can see it in all of his videos and when you ask him about his gear, his recommendation for this combination of tripod and ballhead is unhesitating. When I looked at the Really Right Stuff web site and called to talk to them, I felt that my search for the right ballhead might finally be over. They offer a complete system of uses for the L-plate—everything from a flash bracket to a Macro focusing rail to a clamp system for use with monopods and the black Rapid camera strap. Casey, the person I talked to at the company, knew about every product I asked him about and gave me the time and attention that made me feel as if my needs were the most important thing they were dealing with. I felt like I was a pro photographer gearing up for an important commercial shoot. The fact that that I could attach an L-plate to my camera and never have to take it off clinched the deal for me. I never thought that I would spend as much money on a ballhead as I spent on a DX lens until I spoke to Bryan Peterson. But when I spoke to Casey at Really Right Stuff, I knew that their precision equipment was no match for anything else out there. This was the insiders secret to taking tack sharp long exposure photographs. Besides, I had already spent price of a lens on the all of the ballheads I bought up to this point so I bought the BH-40 ballhead. When the package arrived a few days later, I could not wait to try out my new L-plate and ballhead. The L-plate attached to my Nikon D7000 easily with the wrench tool that came with it. The ballhead fit perfectly on my Manfrotto 190 just like Bryan Peterson and Casey from Really Right Stuff said it would. Then I placed my camera on the ballhead and took it out for a test. Right out of the box you could see that the BH-40 is precision engineered heaven. My camera attaches easily using the L-plate and clamp mount. It moves smoothly in every angle as I compose my shot, and when I find my shot, the camera locks in place with an ease and firmness that seems to defy gravity. I can capture birds in flight with ease and without that jerking, sticky feeling of the other ballheads I’ve tried before. The base of the ballhead is calibrated for panning at 2.5 degree intervals. The most important thing about this ballhead is the fact that it works just as efficiently with my Nikon 70-200 f. /2.8 VR2 with mount on the collar as it does with my Nikon 35mm f. /1.8 small, lightweight DX lens mounted on the camera. The sooner people discover Really Right Stuff products the more time, aggravation and money they will save on this seemingly endless search for the “really right” ballhead and tripod combo. Promoting Really Right Stuff is a public service for new photographers! Sir, you have so hit the nail on the head! After more than a full decade of “managing” less-than-ideal tripod/head solutions, I’ve finally come full circle! I’m ordering the BH-40LR II from Really Right Stuff! Thanks for this honest review.